CINCINNATI -- That guy bagging your groceries or stocking shelves could be an artist with a New York City exhibition. Courttney Cooper, Dale Jackson, Andrew Hostick, Carlos Perez and Diamond Snowden are artists working in the studios of Visionaries + Voices , a local nonprofit organization that provides artistic, cultural and professional opportunities for artists with disabilities. In the last year, each has had his work exhibited at galleries around the region and beyond, including New York City and London. And all five happen to work at Kroger stores around the region. Jackson was wearing his Kroger name tag when he stopped in to Visionaries + Voices' Northside studio last week to work on his poetry-like artwork. The train-of-thought phrases in permanent marker on neon-colored posters have been shown in New York and London. 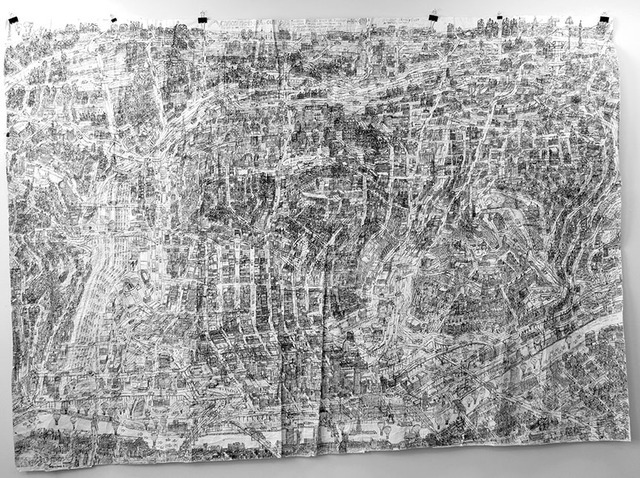 Meanwhile, Cooper's latest map of Cincinnati -- his specialty, hand-drawn in ink from memory -- is on the back of dozens of inventory sheets from the store where he works. The discarded sheets are glued together, coffee-stained and crinkled from being folded up to fit into his backpack. "I don't know many contemporary artists in Cincinnati who have had success like some of these artists," said Skip Cullen, Visionaries + Voices exhibitions director. Cullen's job is to bring attention to the work of the 130 Visionaries + Voices artists. Often, one exhibit leads to another. Jackson's New York City show, for example, brought a curator to Cincinnati where he saw the work of Curtis Davis, another Visionaries + Voices artist. The curator posted pictures of Davis' work on Instagram, and those pictures landed Davis an exhibition in Brussels. "You never know what a curator wants," Cullen said. Each of these artists has a very specific perspective. Cooper, who can recall with precision the exact time and date he visited a spot, recreates those places in ink. Perez, who spent much of his life in Puerto Rico, crafts clay vejigante masks like those he saw in parades and carnivals back home. Jackson's koan-like work draws from his pop-culture knowledge, evoking The Beatles, classic muscle cars and Motown music. 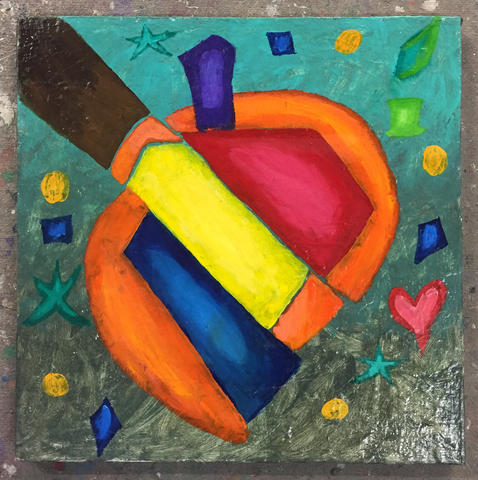 Inspired by Pablo Picasso and Juan Gris, Snowden works with acrylic paints, while Hostick mainly sticks to pencils. To see their work and the work of more Visionaries + Voices artists, check out the organization's website. 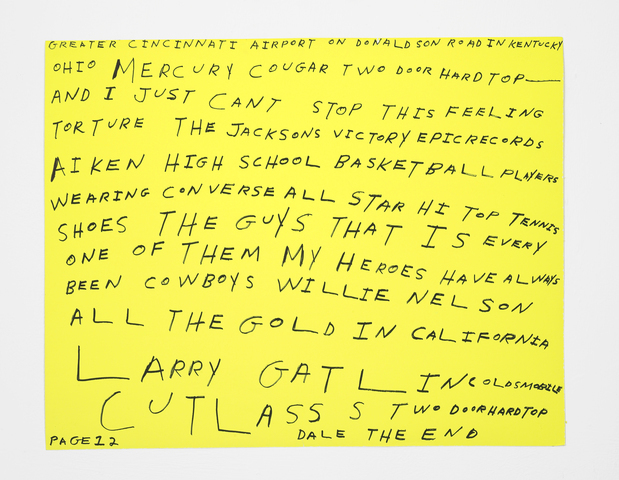 Exhibits: Cooper is one of the most successful contemporary artists in Greater Cincinnati, and his work often is exhibited in and beyond the region. In the last year, Cooper has had a solo exhibition at the Intuit Center and Western Exhibitions galleries in Chicago and at the Outsider Art Fair in New York City. You can see a mural designed by Cooper and painted by ArtWorks in Over-the-Rhine's Plough Alley, or check out the taproom at MadTree Brewing to see more of Cooper's work. 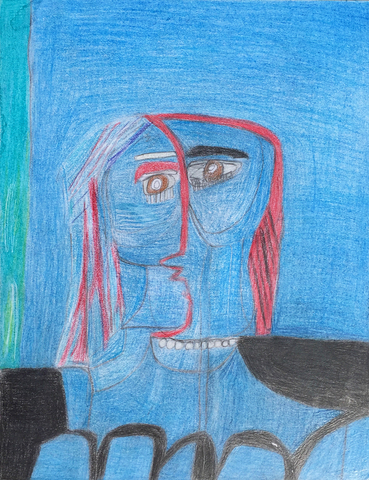 Exhibits: Along with Cooper, Hostick had work displayed at the Outsider Art Fair in New York City this year. He also has had several exhibitions at the Morgan Lehman Gallery in New York City. Exhibits: Jackson just had a solo exhibition at the highly respected White Columns , the oldest nonprofit art space in New York. That show brought about a second exhibition in London at the Rob Tufnell gallery , where Jackson's work was shown with that of Dieter Roth , a well-known Fluxus artist. 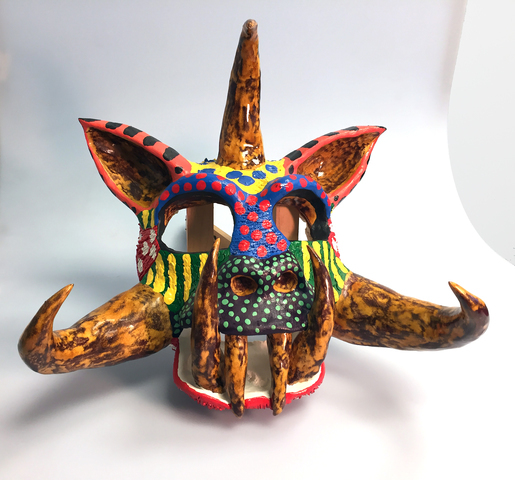 Exhibits: A piece of Perez's artwork, a sculptural mask made in the fashion of traditional Puerto Rican vejigante masks, was selected for the 2017 Arts and Autism Conference in Columbus. Exhibits: Snowden's canvases are displayed throughout Greater Cincinnati, including a recent show at the Art Resource Team 's gallery in Wyoming.